Staying connected and having fully powered devices is part of my every day mission. Have you ever wondered what life might be like without power, nevermind Internet? As many of you know, I make my living online and in order to stay connected at all times, I simply cannot rely on just one full battery cycle throughout the day, no matter what device I’m using. It doesn’t matter if it’s my HP Envy 4 Ultrabook, iPod Touch or my Nexus 5, speaking of which burns battery life like none other. I don’t know about you but when I’m on my devices, I’m a heavy Wi-Fi user. Combine that with the outrageous amount of apps I have open as I write this and there’s no wonder why my devices need to have their own dedicated backup batteries. So, what’s a digital nomad to do when it comes to keeping his or her devices charged at all times? Well, fortunately, I’ve got the perfect solution for you. There’s a good chance you might have already heard about these awesome little devices. Knowing the power and comfortability that comes along with having one of these portable battery chargers by your side at all times is one thing, but actually adding one of these bad boys to your packing list is another. 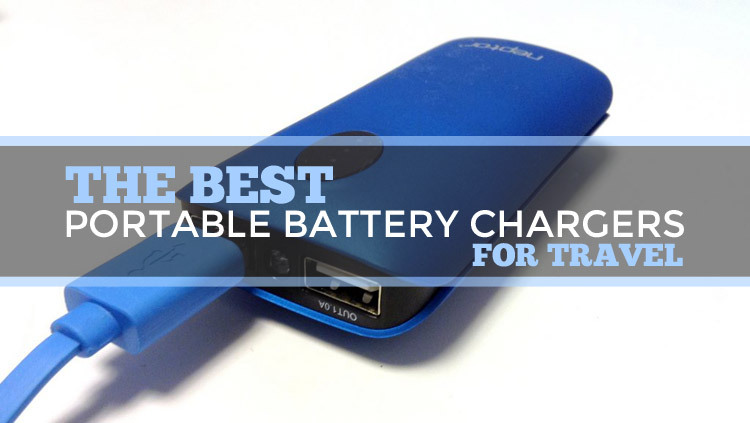 First, let’s go ahead and jump right into my personal recommendation when it comes to choosing a solid dual port charger that is guaranteed to suit all of your wants and needs. Note: I own the unit shown below and I couldn’t be more pleased with its performance. If this model doesn’t suit your needs, or you’re looking for something with a little more power (mAh), be sure to check out the special chart I created at the end of this review which highlights some of the best alternatives on the market. The Neptor Dual Port Portable Battery Charger (NP056K) is a stylish little charger that packs a huge punch when it comes to topping up your juice. Your battery juice, that is. This 5600mAh battery charger features two ports (hence: dual port) which means you can charge not one, but two devices at the same time. I bet you didn’t see that coming, now did you? The two ports provided support charging for both smartphones and tablets — (1) 2.1A port and (1)1.0A port. Did I mention you can charge your devices up to 4 times on a single charge? Of course, this all depends on your device and how much time it takes to fully charge, but I’ve never run into any device that has outlasted the power of my Neptor Battery Charger. Neptor claims that the NP056K can hold a charge for up to 1 year but I personally wouldn’t go that long without charging mine. No matter what the situation, I always plug my charger in a few hours ahead of time if I’m heading out for the day. Using the Neptor Charger or any charger for that matter really couldn’t be simpler. As long as it’s charged, that is! As for the Neptor, simply connect the charger cord into your device and the other end into one of the two USB ports, hit the power button on the Neptor Battery Charger and you’re in business. It’s really that simple. You can check the battery level of your charger by clicking the power button once. Hold the power button in for a couple of seconds to power on/off the unit. Double click the power button and you’ve got yourself a brand new, energy efficient LED flashlight for those times that you’re stuck in the dark without a light. I don’t know about you, but I always find myself needing to top up my batteries when I’m on long flights, bus rides, and road trips. 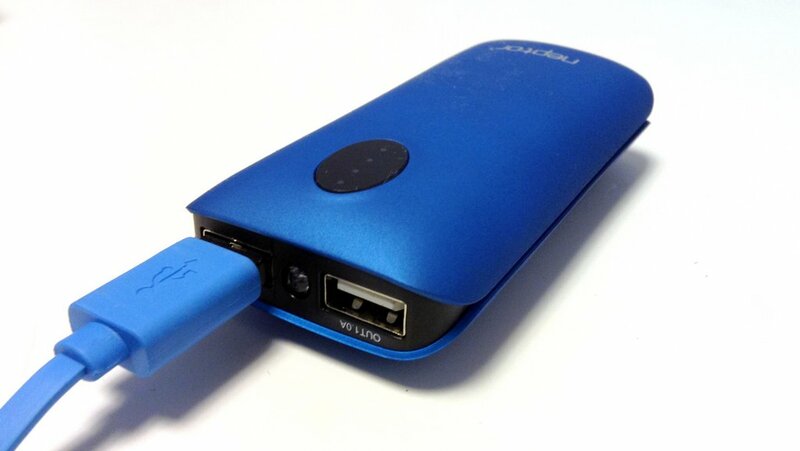 A portable battery charger would also be useful in a situation where you were planning on trekking, hiking, or biking for several days at a time without any way to power up your devices each night. Having one of these chargers on my Pacific Coast Bicycle Tour would have been killer. Unfortunately, I didn’t know about them at the time, otherwise I would have taken a few along with me. As you may or may not know, there are a wide variety of portable chargers on the market. Because of this, I’ve created this special chart below which highlights the best of the best chargers available. At the end of the day, think of a portable battery charger as your “Plan B” in an emergency situation where you find yourself stranded on the side of the road with your mobile device in hand. The only problem is your battery just kicked the bucket. Now, what? Having a portable charger in your pack is like having a spare battery or four. Do yourself a favor and purchase a charger before you take off on your next trip. It’s a small investment that will save your sanity time and time again. 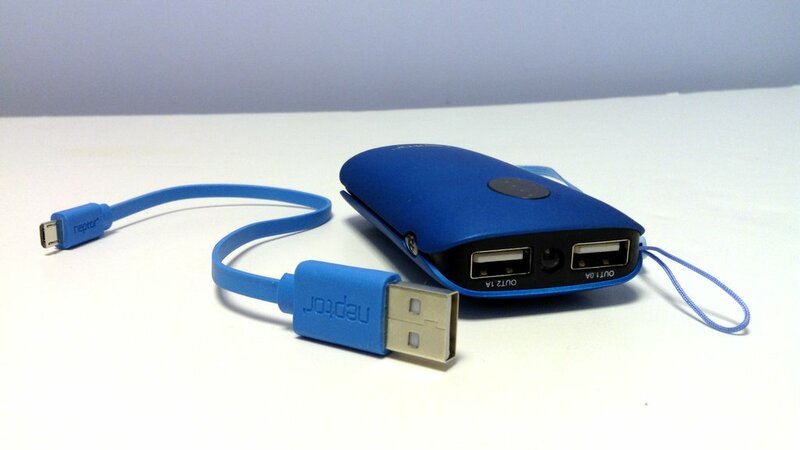 What would you use your backup charger for? Leave a comment below with your recommendations! Love portable charges – keep a small one in my day pack so if I’m out and about on the tundra or in town, the cell (and therefore camera phone) are charged and ready. Thanks for chiming in Maria. Glad to hear it! Looks like you’re already one step ahead of the game with your portable battery charger. Which model do you own, if you don’t mind me asking? The RAVPower Deluxe looks cool. Definitely, Mike. RAVPower is a great brand, too. Thanks for sharing Ryan! I was previously using a New Trent but I need more power because I’m often out for the whole day and the charger I bought was too small (a couple of years ago now). I’m actually waiting for a Neptor charger myself. Stoked you like them. No problem, Arnette! Just sharing my love for these things. They’ve saved me on numerous occasions. I think I’m going to get a more powerful one like the RAVPOWER Deluxe for longer trips. I’m definitely going to invest in one of these before heading to Southeast Asia in a few weeks! Excellent point. I will get to work on updating this chart. Thank you for the feedback. I bought many portable chargers and they all start to fade away and don’t hold up as much power compared to when I first bought it. Maybe these other brands might be better I will have to give them a try. However, ill suggest the Powergo ss 5000 from tech get go. Its not put on the list here surprisingly. I have owned this product for about a little over 4 months now and I must say its my new must have portable charger. Its recharges so much more faster then the previous power banks I owned. It recharges itself so quick that I can feel its like 15 times faster charge speeds then any other portable chargers I have owned including my new Qualcomm Q.C. 3.0 portable charger I also bought from amazon to give it a try. the power bank pretty much finished charging itself in like under 15 minutes. When I use it to recharge my iPhone it recharges not as fast but I can tell it charges much faster then my wall charger. I would have to recommend the powergo ss 5000 to anyone who wants a really quick charging power bank.